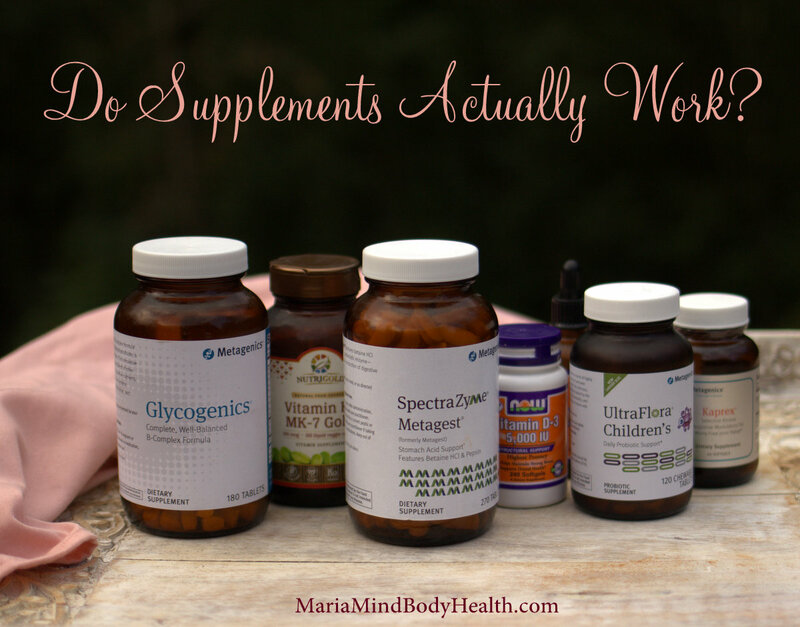 You may be wondering why we need to supplement if our ancestors never did and do supplements actually work? I had a client contact me after she asked her doctor if she could add in the supplements I suggested to her (such as zinc, magnesium, a probiotic) and he laughed and said that she was wasting her money. Guess what? 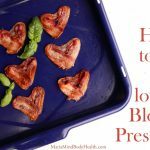 She was on 2 blood pressure medications and acid blockers! Seriously? 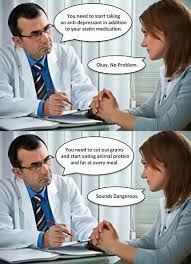 I wish doctors wouldn’t be so disrespectful to the power of food and supplements rather than push prescription drugs! There are many ways supplements can help. 1. First I want to ask if you are taking any prescription drugs such as birth control? Metformin? Acid Blockers? Did you know that almost every drug, even over-the-counter drugs deplete you of some vitamin or nutrient? Birth control pills deplete you of a few things, one of which is zinc. Low zinc levels is a common cause of cleft-pallets. So if you or someone you know takes birth control I suggest taking adequate zinc or a quality multi-vitamin for at least 6 months before trying to get pregnant. *NOTE: Do not add in zinc too fast, it will cause nausea if you are deficient. Start slowly. Metformin depletes you of iron and b-vitamins, acid blockers make your intestines look like Swiss cheese so you have a hard time absorbing anything. I had a client that was on acid blockers since the age of 19 and at the age of 32 he had to get most of his intestines removed. But gosh-forbid a doctor thinks I’m a quack for getting patients off acid-blockers with the proper diet and supplements! Sheesh! Sorry about my rant, I’m just upset with getting laughed at by medical professionals that believe expensive prescription drugs are the answer. Over-the-counter pain medication such as Ibuprofen are hard on the liver which causes inability to lose weight and low moods. My point is that everything people take because their doctor prescribes it is depleting their bodies of needed nutrients. 2. Do you have a thyroid disorder? If you have a low thyroid, you are also most likely low in hydrocholoric acid (HCL, which a healthy thyroid produces) and if you are low in HCL you cannot absorb nutrients well. Adding in a supplement is not only helpful for digestion, but it also will help your thyroid which is screaming for therapeutic doses of nutrients! You can’t heal if you aren’t absorbing them! You could be taking a “magic pill” but you won’t benefit from any of the ‘magic’ because you are not absorbing it. 3. Do you eat organ meat? I wish I liked them more. Sure, I will try to hide ground liver into my chili, but do I eat it every day? Nope! Why do I bring organ meat up? Well, it is the best source of vitamin K2 (I’m not referring to the blood clotter K1). K2 is probably the most important supplement in my opinion. 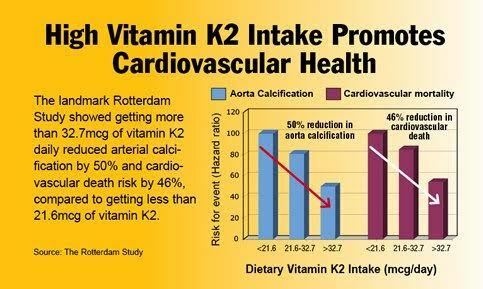 K2 helps get calcium where it needs to be… into the bones and keeps it out of where it shouldn’t be (arterial plaque, etc)! I promise you, if you start taking K2 on a daily basis (with food, it is fat-soluble), you WILL notice that the plaque behind your teeth will go away! I hear this all the time from clients. This is one way you know that the calcium isn’t getting built up and is getting into the bones properly. My Grandpa Vince had his first heart attack at age 32. I worry about my dad often and I mail him vitamin K2 every month, but not only that, I text and nag him to remember to take it. It doesn’t do any help by sitting in the cupboard. You need to remember to take it! If you have kidney stones or gall stones, K2 is the best thing to help! In this case I suggest 300mcg at your first meal of the day. Otherwise 100 mcg is good for most people. Click HERE to find a quality K2-MK7. 4. If you don’t know already, I adopted my boys from Ethiopia. Once you adopt children and bring them into the US, you often take them to the doctor to check for parasites and such. My boys lived on the equator and the toddlers (my older son) were outside playing all day. When they checked their vitamin D, they were in the low 30’s. TOO LOW! How could this be? They don’t even have sunscreen at the orphanage? Well, they have dark skin that doesn’t absorb d as well. Yes, I do believe getting quality sunlight is key to getting adequate vitamin D but even this didn’t get my boys’ levels up. This is why my boys take vitamin d even in the summer (always with breakfast since vitamin d is fat soluble) but especially in the winter. Before I started my job as a nutritionist, Craig (my husband) and I had some really tough curve balls thrown our way. I was a rock climbing guide and I loved my job but with the bad economy came bad news. Craig lost his job which was our main source of income. Shortly after that happened, I went to have my yearly physical and I was a puddle. I cried at the drop of a hat, worried that we were going to lose our house and our dream of adopting children. My doctor immediately thought she would be a helpful “problem-solver” by offering me an antidepressant (which have serious side effects and are very difficult to get off of). She did not check my vitamin D levels (which ended up being low after I had them checked with a new doctor), nor did she check my liver health, which was also probably horrible with my high carb diet at the time. Not to mention the fact that I was also training for a marathon which added stress to my adrenal system. She also did not ask if I take a probiotic. All of these should be a prerequisite for patients to test and incorporate before being offered these mind-altering addictive drugs with lots of side effects. We would save a whole heck of a lot of money on health insurance! On top of that she did not ask what my diet was (p.s. this is the same doctor that didn’t ask about my diet when I had severe IBS, needless to say, after this visit, I changed doctors). In biology class we are taught that our blood is manufactured and begins in the bone marrow. 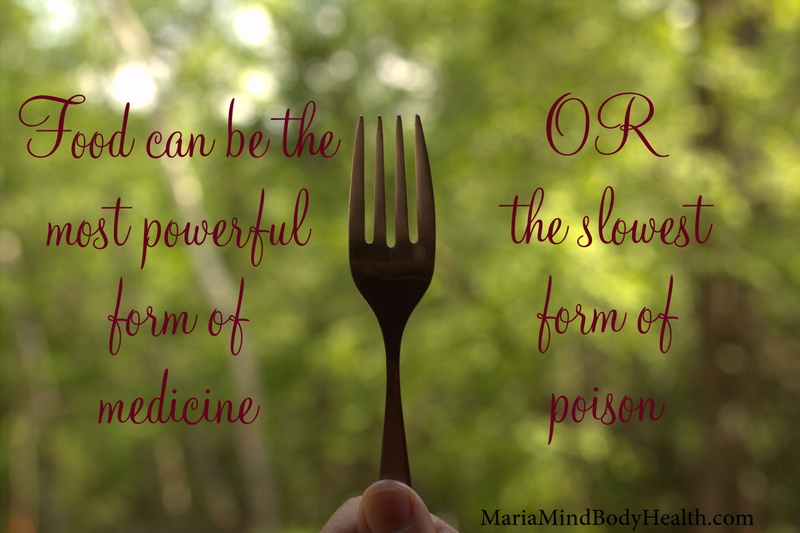 In Chinese medicine, we are taught that our blood begins on the end of our fork. Yep, we really are what we eat. You also need magnesium to make serotonin. Why do you need to supplement with magnesium? Well, most of the magnesium was found in water but now most people drink treated, softened or bottled water which is devoid of magnesium. Magnesium salts in water make deposits in your water pipes and makes it difficult to get a decent lather with soap. This problem was solved with the development of water softeners, but the process gets rid of the magnesium. Our ancestors drank untreated well water or water from a stream which had a lot of magnesium. Since our water is now depleted and you don’t find adequate amounts of magnesium in foods, I suggest taking a quality chelated magnesium supplement and at least 400 and up to 1000mg per day. Click HERE to find. For most of my clients and their children, magnesium is relaxing so taking it at bedtime helps them get quality sleep. In rare occasions, magnesium is energizing, so if you find yourself unable to sleep after starting magnesium, I suggest to take 400mg at breakfast and if needed, another dose at lunch. Everyone has a different tolerance with magnesium and the only problematic side effect is loose stools (alternately, magnesium citrate can help with constipation). This will happen if you take magnesium oxide that you purchase at a large retail store which is a non-absorbed form of magnesium (which is probably why studies say supplements don’t work! The participants are taking junky version of vitamins!). Always look for magnesium glycinate, which I have only been able to find online. If you still have issues with loose stools even with a small dose of magnesium glycinate, I suggest you use a topical magnesium or Epsom salts in a bath. One of the main symptoms of magnesium deficiency is hyper-ness and anxiety. A main source of magnesium is “fortified whole grains” (which is just magnesium supplement added to the grains). So, if you remove gluten from the diet like I suggest you do, you are also removing a major source of magnesium. Since calcium competes with magnesium for uptake, adding in calcium supplements without sufficient magnesium (and NOT at the same time as calcium) also increases a magnesium deficiency. 6. When a woman is pregnant, her body significantly increases copper for the fetus. After giving birth many times a woman has difficulty eliminating this excess copper causing an imbalance of copper and zinc. This high level of copper increases post-partum depression. Another reason to supplement with zinc after giving birth! 7. During pregnancy, the immune system starts to change and circulate to protect the fetus. Once the fetus is born, the mother develops antibodies against her thyroid. In this case, adding 200mcg selenium while pregnant is not only very safe for the mother and fetus, it also lowers the autoimmune response after giving birth. Click HERE to find. 8. If you are Intermittent Fasting or dieting (calorie deficit) you most likely are low in therapeutic nutrients. Intermittent fasting gives you all the nutrients you need to maintain but higher doses (therapeutic) are needed to get your body back to where it should be. Also, some supplements will help you keep cravings low to achieve your goals. After decades of depleting our bodies from specific nutrients many times we need therapeutic doses of nutrients to get us back on track! After you are back on track you can reduce or eliminate many of them. 9. Increased IMMUNE SYSTEM: The best thing to take to boost your immune system is a quality probiotic with bifido bacteria. Even my children take this. Coming from Ethiopia you would assume they would have caught numerous new illnesses that they have never been exposed to, but you know what? Nope, with the ketognenic diet and probiotics they rarely get sick. In fact, Micah threw up for the first time at the age of 6 and Kai ran over to me and yelled, “Mommy, something happened to Micah!” They were confused by what happened because it never happened before. What saddens me is I had a client with cancer and when she asked her doctor if she could take the probiotic I recommended they said no. Boosting her immune system is not harmful!!! Arg. Is food important? YES! You are not going to heal anything by eating Cheetos and taking supplements. Food comes first. But with proper diet, the addition of certain nutrients can help you heal faster, as well as get off medications. Do not be fooled by magazine articles and medical professionals that claim supplements are a waste of money. True, quality supplements matter, but if you add in the proper ones, I promise you, healing happens faster! I have hundreds of testimonies from clients who have had amazing results using supplements (and of course diet) to heal their bodies. Here is just one of the many. A great update from my phone client!!! “I started Keto as a way to heal. 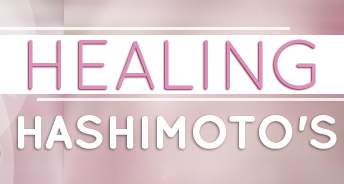 Basically as a last straw to my Hashimotos (low thyroid) and all the autoimmune and other things this dis-ease has done to my body, including weight gain which caused high blood pressure and brain fog, ADD, continual exhaustion, etc. A little over 5 weeks ago I had a one hour phone consultation with Maria Emmerich and a few days later I had a doctor’s appointment. My feelings was if I was going to pull this last straw I was going pull it right. So with personalized advice from Maria and my doctor on board, I started this journey 7/30/16. Re: 3. Organ meat is the only source of K2. I’m a bit puzzled by that. Isn’t it also in natto, chicken, butter, egg yolks, and cheese? Or do you mean *significant* source? There are several different forms of vitamin K2. MK-8 and MK-9 come primarily from fermented dairy products, like cheese. MK-4 and MK-7 are the two most significant forms of K2 and act very differently in your body. For a supplement you want to look for the MK7 version (stays in body much longer than MK4). Great info, i’m a little overwhelmed 🙂 I know supplements can work, if you’re deficient. My dr took me off calcium & vit D because it was so high. I did try supplements & diet for other problems but never had any luck: arthritis, high blood pressure, high blood sugar & acid reflux. I take meds for all and supplements for arthritis. Turmeric & ginger work good, but not enough. I’d never heard that about metformin…I feel drugged all the time, so sleepy. but my blood work always comes back good. and reflux, what can I do about that, diet doesn’t work, I’ve been LC for 3 years. I started with tums, then zantac, then 2; now I take Prilosec, I only take half the does. this post has gotten me quite concerned. I appreciate the time you put into this post. Very helpful and encouraging. Your frustration is not falling on deaf ears Maria. I feel it. I also think and feel the same as you. I always have. I’m 68 and take no meds. I understand nutrition so much more since I found you. And believe me you have not only influenced me but any one I meet I tell them about Keto. My family members are all coming over. I even met a woman in Costco yesterday that I helped. Actually I should carry your business cards in my wallet. Keto for life! Awe! You are so kind!!!! Does it matter if I use storebought conventional liver instead of grassfed? It’s so expensive! How much hydrocholoric acid? Brand? I like Spectrazyme metagest by metagenics. Take until you feel burning. 1-3 caps at a meal. I was under the impression that K2 also came from dark leafy greens–this is why I imbibe freely on Lacinato kale. I also eat some of the sources mentioned above in the comments. I had my own D3 tested about 3 years ago, and it, too, was in the 30’s. The doc gave me a prescription of 50k units once a week, and when it was finished, I whipped out my calculator and did the math: 50k divided by 7 = around 7143 units per day. The highest I could find in one pill was 5k, so I take it twice daily. My D3 levels are now in the 70’s (I request it be tested annually along with an NMR and whatever else the doc wants to look at). In short, YES supplements do work, but only if you use them properly, get pharmaceutical grade with no fillers (such as rice flour, titanium dioxide, etc. ), and make sure they’re third-party tested for purity. him enough calories for weight gain and muscle gain. He is holding steady and not losing more but needs to gain some. 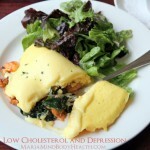 Any suggestions on how to alter diet to gain weight? I have many people eat Keto and gain weight. You could add in fat bombs or MCT oil into smoothies. I currently don’t take any supplements. I want to use a good brand and I am just not sure about what is available in the local stores. What brand(s) do you recommend? Maria – do you recommend a multivitamin on a keto diet? Do your kids take a multi? And if so, which ones? I have the MTHFR mutation and know I need methylated b vitamins but it’s so confusing! Thank you for all these great posts by the way. At your suggestion, I put my dtr on the metagenics kids probio, gluten/dairy free and no more tummy aches! Sometimes. My kids take probiotic and vitamin d and k2. I make my own sauerkraut for probiotics…..more naturally occurring good bacteria is my understanding, from Dr Natasha Campbell-McBride and Dr Mercola et al, than in supplements….SO easy and delicious! AND so much cheaper!!! Sorry I realise this is a post on supplements….but what better ‘supplement’ than Nature-provided….!!! LOVE our work Maria….and your books!!! I take glucomannan (which I think I read about in one of your books) but I also occasionally want to take a carb blocker like white kidney bean supplements. Will those two clash? Do you know of a site where I can check to make sure that two things I’m taking won’t cause a problem? Thanks! No. I would not recommend glucomannan. I don’t recommend either. Can you elaborate more on why you don’t recommend glucomannan? I use Now brand glucomannan in cooking. In your book “Secrets to a Healthy Metabolism”, you recommend 5-HTP. I am hesitant to take it since I am already on Wellbutrin XL. I plan to ask my dr, but am I being overcautious? I dont want to just stop taking the prescription, but dont want to double up by adding the supplement either. Hi! No. if you are on An antidepressant you do not want to take 5-htp. You have to slowly wean off the antidepressant. Which probiotic do your kids take? It doesn’t have soy? Is the now brand of k2 bad? Yes, I like the NOW brand of K2. For the past couple weeks, I’ve had this fuzzy feeling on the top of my head–today, it’s all over. Is this a sign of a vitamin deficiency? If so, what? I don’t recommend any supplements that aren’t ok to take for long periods if needed. They are all natural to the body and won’t cause any issues if taken as prescribed. Yes, as part of your questions in the health assessment I can recommend how long to take any supplement. 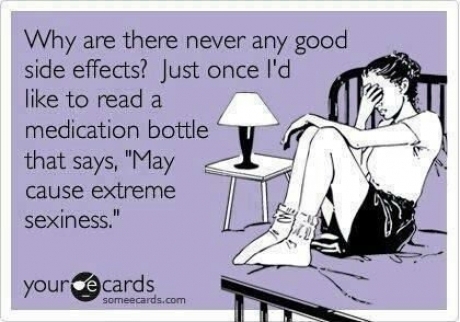 In general many that I recommend are therapudic doses that you can stop after the bottle is empty. Thank you for this info! This is the first I’ve heard about K2, and it’s something I want to try. Is it necessary to always take it with vitamin D? And if so, does it always have to be in a certain ratio? Thank you! No. You can take without d.
What brand/supplements do you recommend for kids? I’ve recently started keto with my 3 children and my middle son is getting headaches a lot. I feel like he may be deficient on elextrolytes. I have all of your books- love that they are helpful for kids. Thanks so much. Do you recommend vitamin k2 or vitamin k2 mk7? The article talks about k2 but then the link goes to k2 mk7. Thanks!